Labour's Richard Corbett MEP said the comments were "as historically illiterate as it is deeply offensive." A Tory MEP has provoked outrage after telling a German socialist politician that the Nazis “want the same things as you”. Udo Bullman, a centre-left German MEP, had been warning Parliament’s Conservatives that they have to choose between supporting the EU and democracy or “opening the doors wide to right-wing extremists”, in a debate in Strasbourg today. Kamall’s comments provoked jeers, eye-rolling and shocked laughter from many MEPs. “Rubbish,” one shouted. “The first one he killed were socialists you idiot,” said another. Nigel Farage, on the other hand, was sat next to Kamall nodding in agreement with him. “It is unbelievable how a member of this House can dare to associate the murderous Nazi regime with the Social Democrats. Eighty-five years ago, the [German social democrats] SDP was the only force in the Reichstag that voted against Hitler’s Enabling Act, as other opposition had already been sent by the Nazis to concentration camps. “The words by Otto Wels will be remembered forever: ‘Freedom and life can be taken from us, but not our honour.’ Social Democrats throughout Europe resisted Hitler’s regime and paid for it with their lives. With his disgusting comparison, Kamall has mocked these brave people. “His comparing of socialists to Nazis is as historically illiterate as it is deeply offensive, and for him to have directed those comments at the German leader of the Socialist Group beggars belief,” he told LFF. 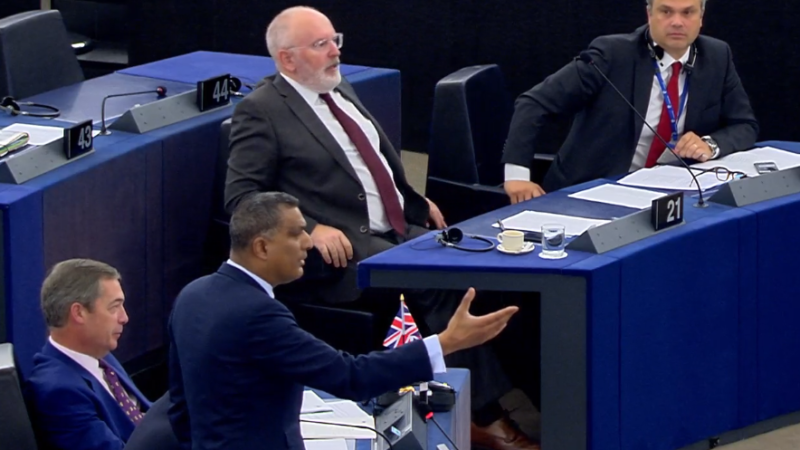 Syed Kamall is the Conservatives’ most senior politician in the European Parliament. He is the chair of their European grouping which includes controversial nationalist parties like Poland’s Law and Justice. According to the United States Holocaust Memorial Musem, Communists, Socialists and trade unionists were among the earliest domestic opponents of Nazism. The exchange can be viewed at 9.38 here.